This sturdy, adjustable frame is able to hold two bikes at once. The velcro straps keep your bike safely in place on your trunk and the six strapping points, as well as the six foam pads, keep everything stable and in one place. Tackle and trip with VViViD! Extremely user-friendly design is able to hold two bicycles at once. 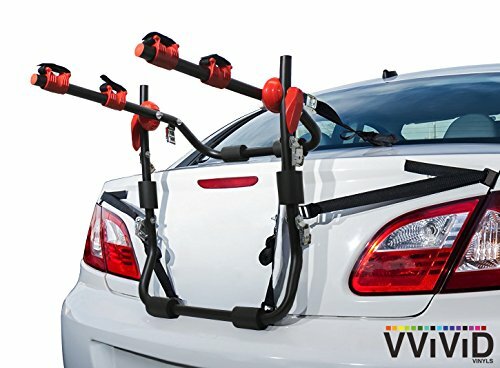 Unique adjustable, durable plastic toothed clamps allow the rack to be adjusted to fit any size or trunk. Features hooked nylon straps, six strapping points and foam padding for maximum protection. Perfect for most Sedan-type vehicle trunks, as well as hatchbacks, minivans and SUVs (without exterior spare tire). Full instruction guide, featuring guide for different makes of vehicles, included in box. If you have any questions about this product by VViViD, contact us by completing and submitting the form below. If you are looking for a specif part number, please include it with your message.